Usually, I am not a fan of ‘boutique’ or ‘micro-brand’ watches for several reasons. Many times these watches are not very original in their designs, suffer from poor resale value or just don’t exhibit the quality finishing or details of a higher-end name-brand piece. 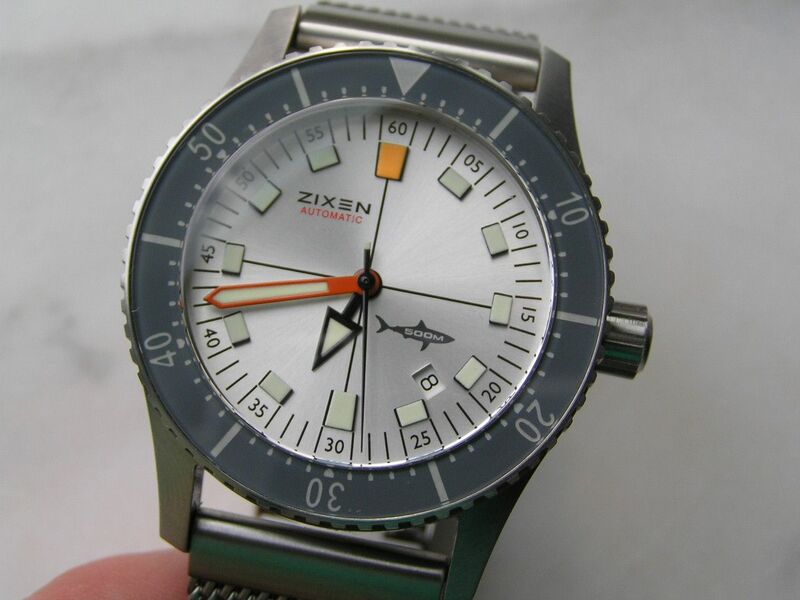 But when I saw this Zixen Vintage Diver for sale, the overall look of the watch really struck me and wouldn’t let go. I had to have it. I bought it and have been very pleased with its accuracy, build quality and unique looks. 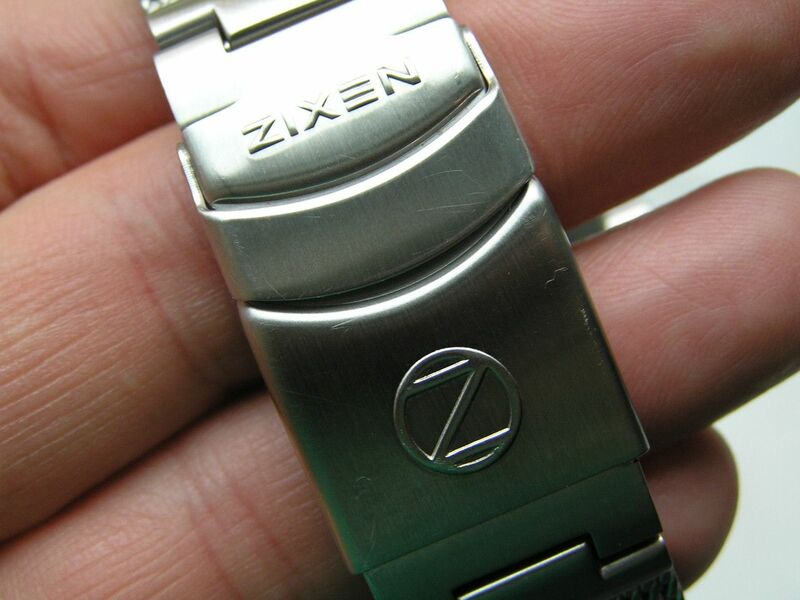 Zixen is one of a myriad of companies these days producing watches (primarily diver watches) that are not associated with a huge Swiss watch conglomerate or a mass-produced brand like Invicta, hence the ‘micro-brand’ moniker bestowed upon them. 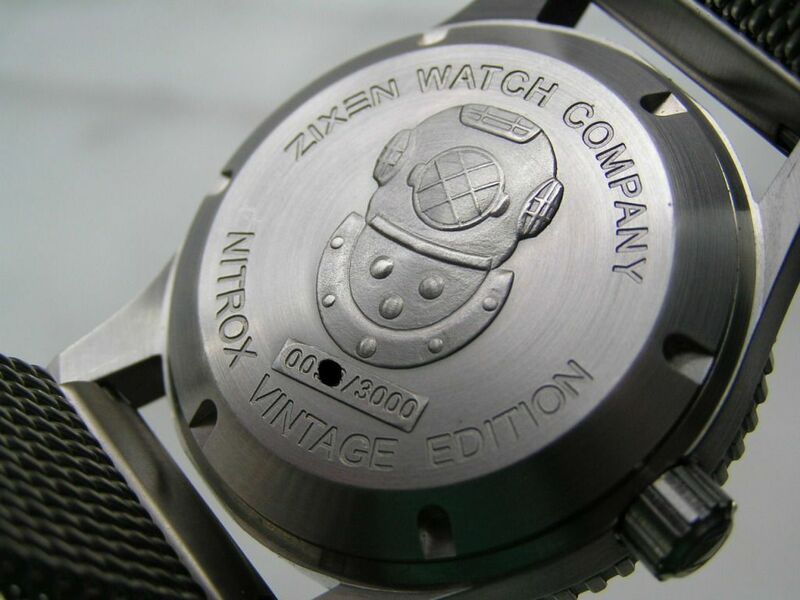 While their watches are not cheap, I have been impressed with what Zixen has to offer, at least with the Vintage Nitrox that I purchased. The company’s slogan is ‘Made by a Diver for a Diver©’. They also claim to have a rigorous design and manufacturing process, ensuring that their watches will live up to their stated water resistance depths and perform well under a variety of extreme conditions. That’s good to know. 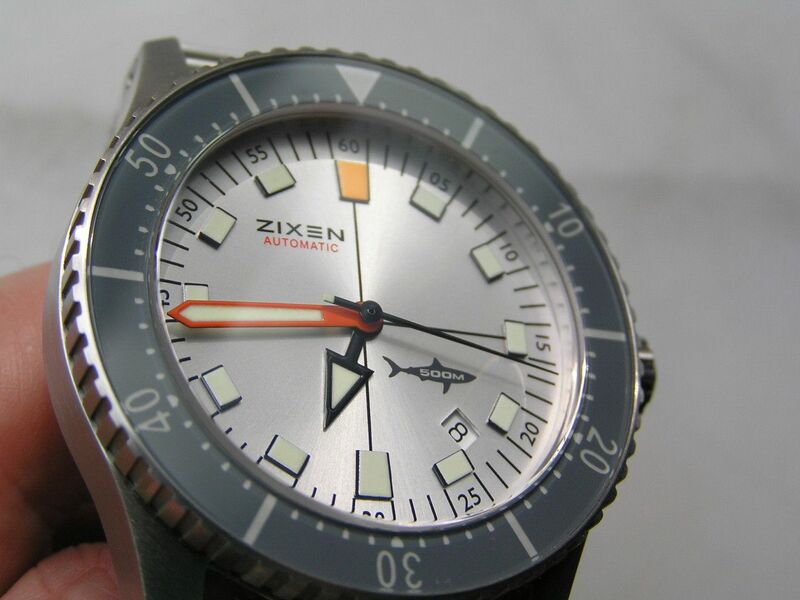 The Nitrox comes in several iterations and colors, and Zixen is continually introducing new models and styles, so a visit to their web site is a must if you’re interested in what they have to offer. 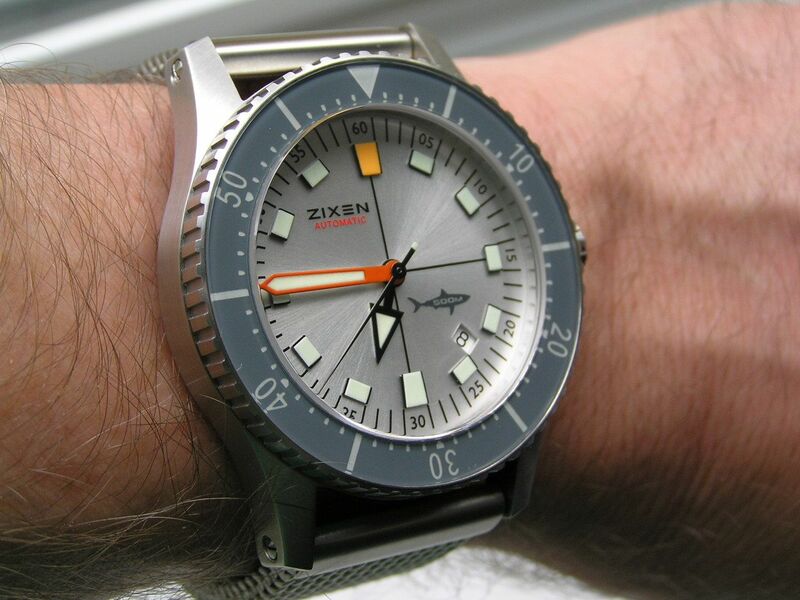 This Zixen Vintage Nitrox starts with a large, fully brushed stainless steel case measuring 44mm without the large (but not overly so) signed screwdown crown; 48.7mm crown inclusive. Lug tip to lug tip is 53.9mm. The back is brushed and screws down and is emblazoned with the Nitrox logo. Case thickness is a substantial 16mm, with lug spacing of 24mm. Surprisingly, this watch does not wear large or feel unwieldy on the wrist. Another check mark in the plus column. Case finishing and overall fit and finish is very good. The straps and bracelets are secured by screw-in lug bars instead of spring bars for an added measure of security. It’s also nice to have a brushed finish on a tool watch for a change; sometimes the polished bits showing up on divers these days is a bit much. 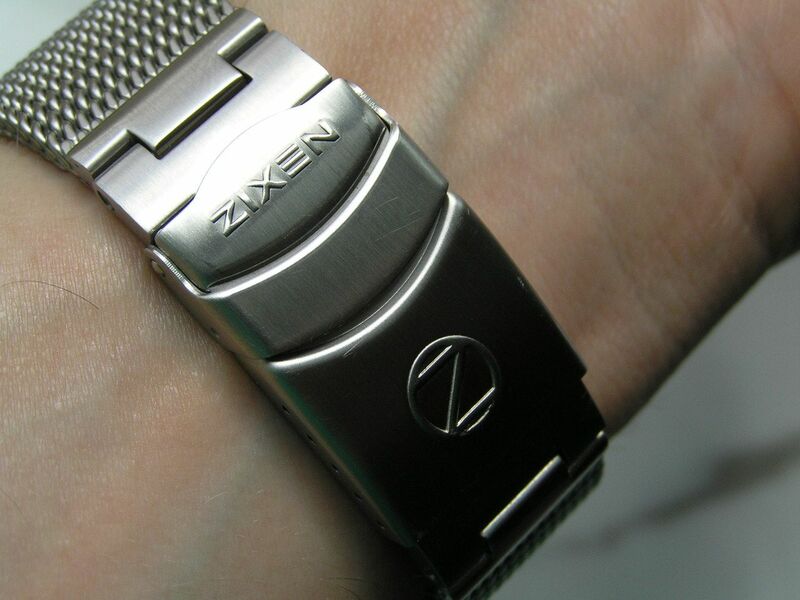 Zixen states that their watches are made with an anti-magnetic system that exceeds DIN 8309 and ISO 764 standards. 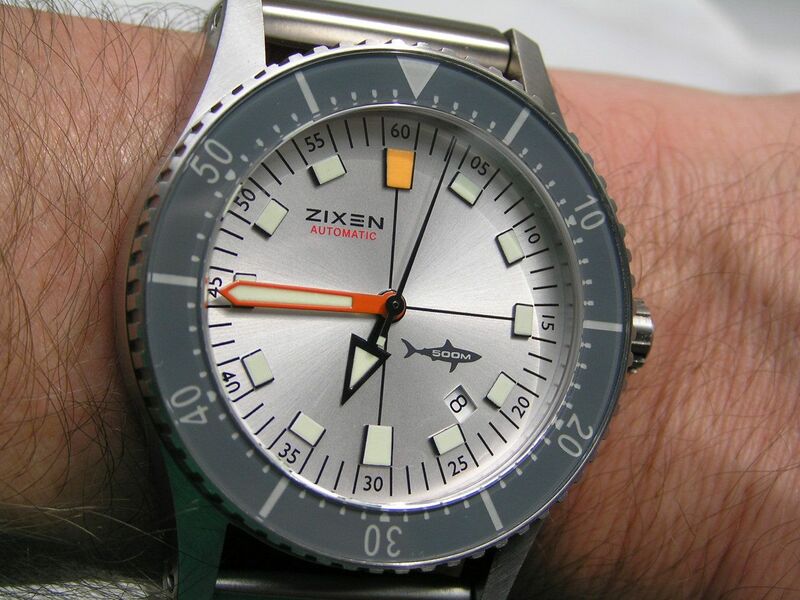 The dial design is what really captivated me about this Zixen Nitrox diver. To me, it has a 1960s shortwave radio look to it. I know this seems like an unusual comparison, but to me it fits. The dial is silver, with black minute markers all around and arabics printed at each five minute mark. The hour hand is a short black arrow with generous lume, while the minute hand is a slender stick style in bright orange and plenty of lume. 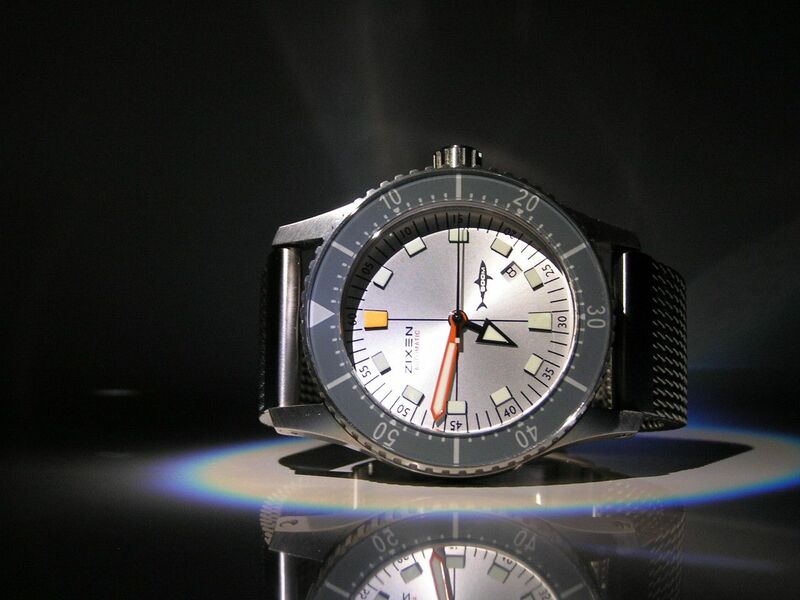 A simple black seconds hand looks good and has a small section of lume on its tail, so a diver can see that the seconds hand is moving so they know their watch is running while they are diving. This is important if they are timing their dives using the bezel. Overall lume quality is excellent. 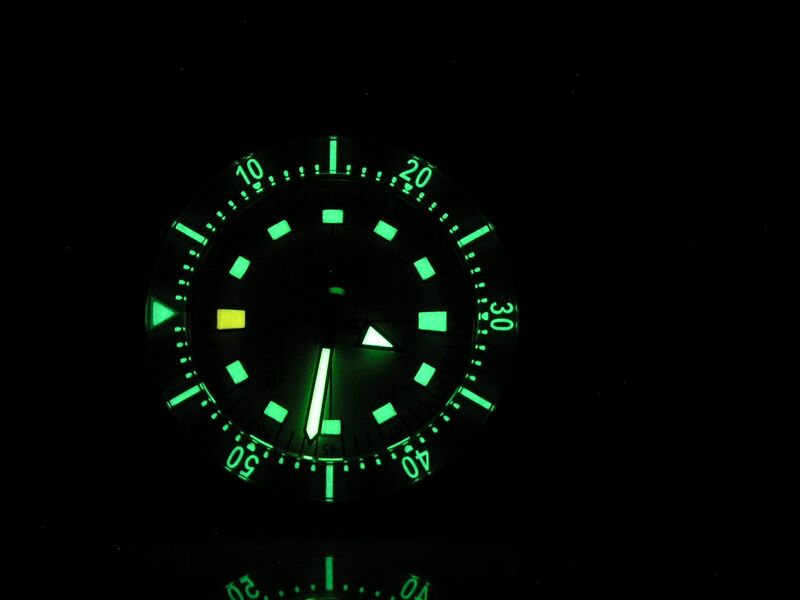 The dial also has square lume markers at each five minute mark just under each arabic and a yellow/orange marker at the 12 position. The overall combination of colors, styles and designs on the dial really works and does exhibit a vintage look while still having a clean, semi-modern feel to it as well. Nicely done! There’s a quickset date window at 4:30. The date window is frameless and rather small, making it hard to see the black on white date wheel at certain times. Otherwise, alignment of the wheel inside the window is fine. 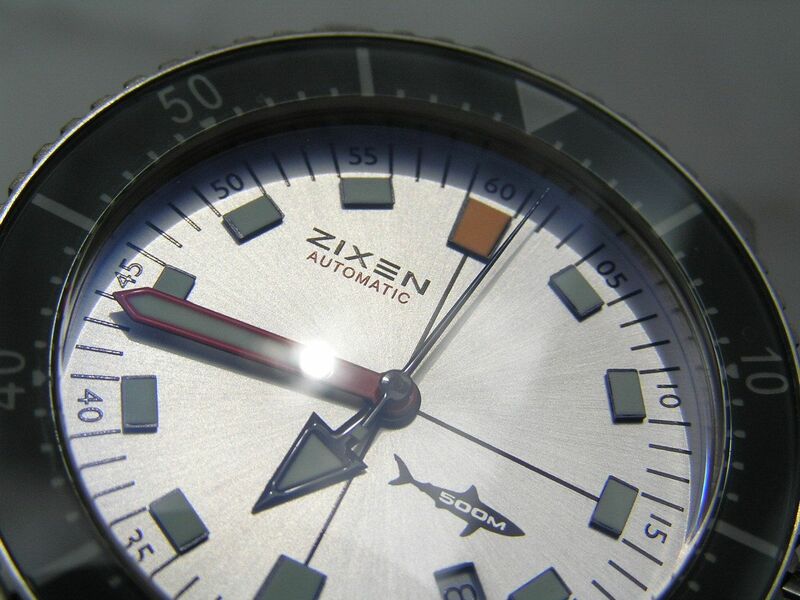 Minimal dial printing consisting of the Zixen name and ‘automatic’ in the upper left of the dial, and a fish logo with ‘500M’ in the lower right of the dial complete the presentation. There’s also a black crosshair that divides the dial into quadrants. The dial is capped by a slight domed sapphire crystal that’s anti-reflective and 4.5mm thick, to resist the 500 meters of rated water resistance the Nitrox is capable of. The bezel is another winner on this watch. A 120-click unidirectional design with an inverted lume triangle at the 12 and arabics and minute markers that encircle the entire bezel. The bezel is done in a grey/grey blue with a sapphire coating that looks and feels cool. The bezel’s markings are also fully luminous. Superb! So far, it seems like I’m being pretty nice to this watch, especially from a guy who doesn’t really embrace boutique divers. 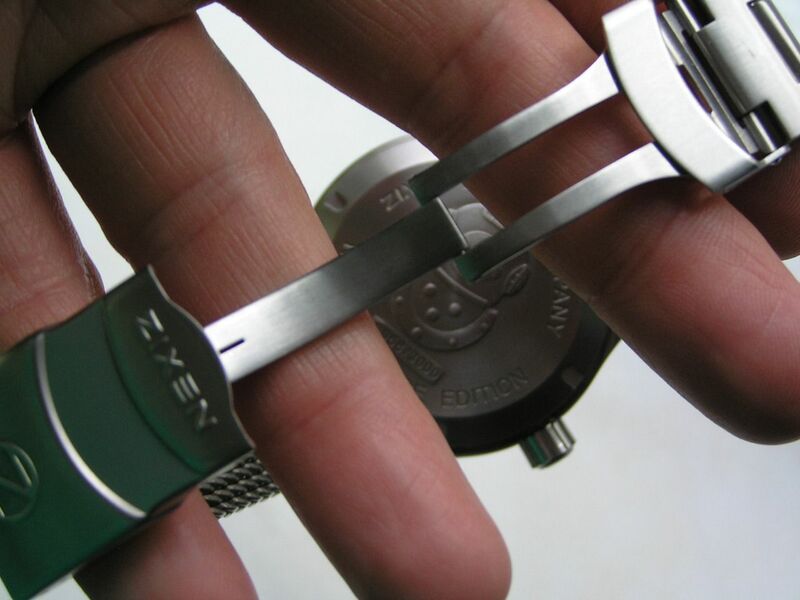 Beating inside the Nitrox is a tried and true ETA 2824-2 25 jewel automatic movement that hacks and manually winds. Familiar to most WISes, this movement is ubiquitous in the watch world and can’t really be faulted. In the instructions, Zixen makes mention that all their watches leave the factory within +10/-6 seconds per day accuracy. While not COSC certified, the ETA 2824-2 inside my Zixen Nitrox runs at nearly ZERO gain or loss per day! Certainly the most accurate non-COSC 2824-2 I have yet to encounter. Absolutely amazing. Power reserve is the expected 40 or more hours (41-1/4 hours to be exact). Overall performance (winding, setting, running) of this watch is perfect, so nothing at all to complain about here. I purchased my Zixen second hand and the watch came with all three bracelet/strap choices. I sold the multi link bracelet (straight solid end links, machined deployant, solid links) and the rubber strap and retained the stainless steel mesh bracelet. 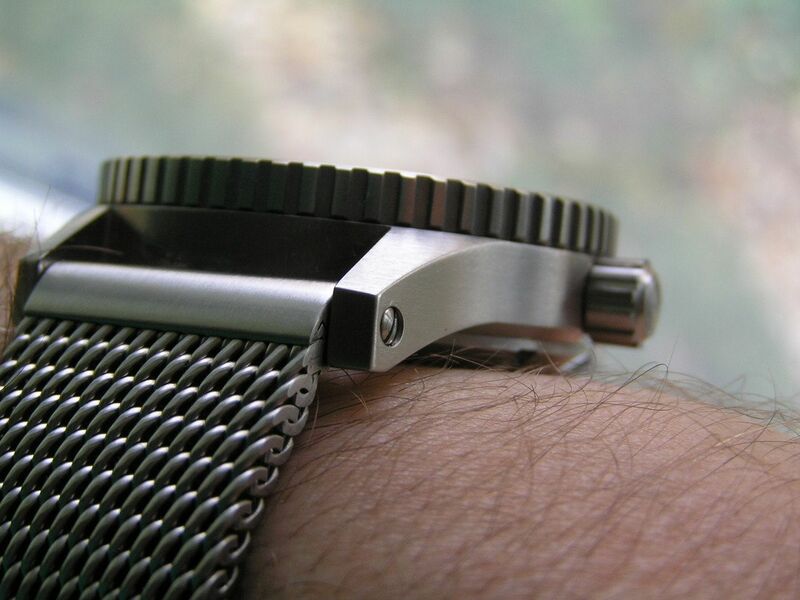 The mesh is super and looks great on this watch. It has straight ends, which work well with the size and heft of this watch. The mesh is 3.7mm thick and nicely finished. The clasp is double locking and signed, with a machined deployant. 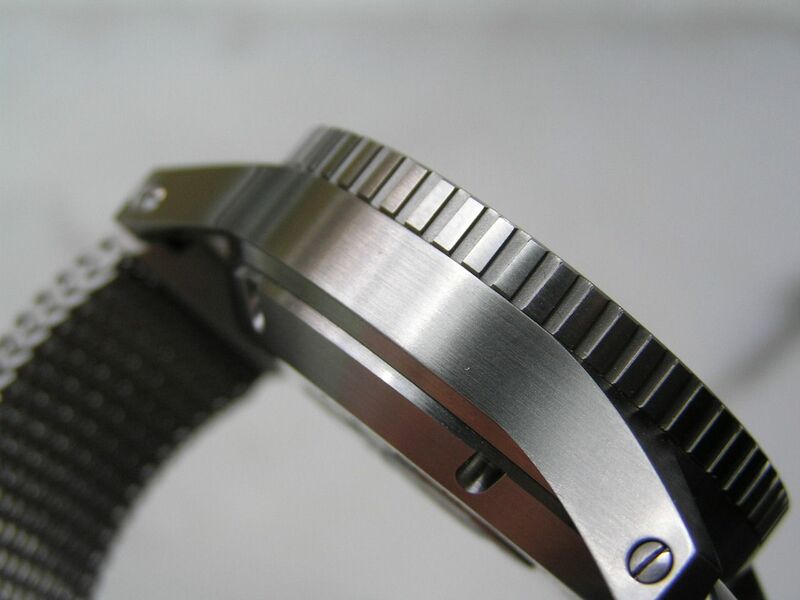 Curiously, there’s no diver extension on the clasp, another odd omission for a true diver watch. 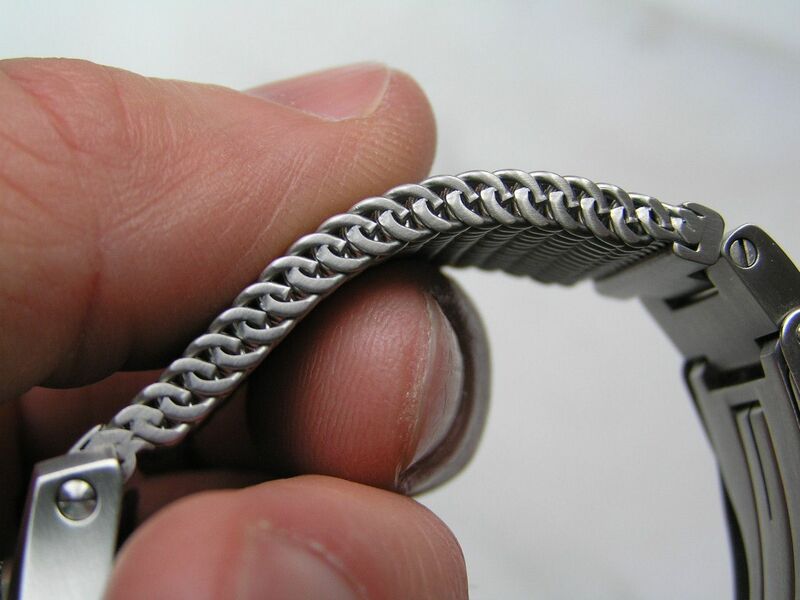 The bracelet’s design is one that has several solid links on each side of the clasp for sizing purposes, with five microadjustments on the clasp as well. 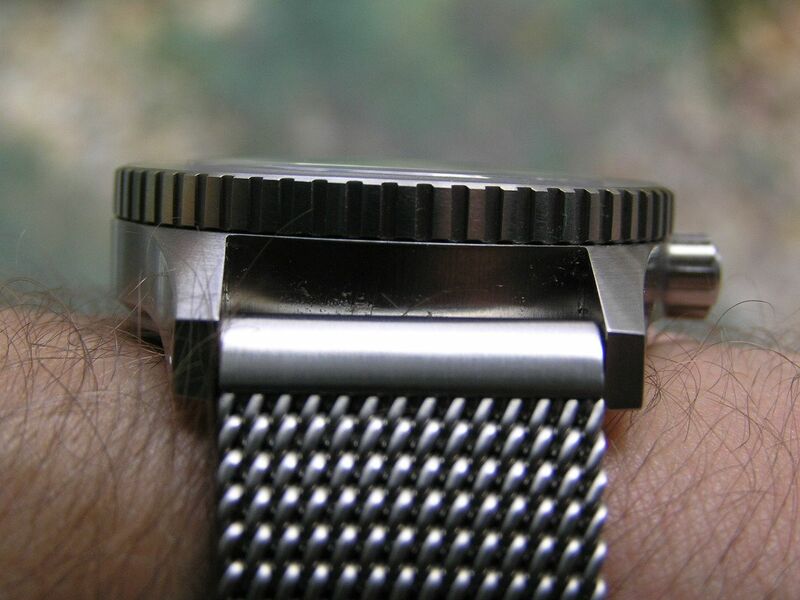 The mesh bracelet measures 24mm at the lugs and tapers to 19.5mm at the clasp. The mesh is tight and smooth, so there’s no hair pulling or discomfort while wearing. Presentation is a black cardboard outer box with separate lid and a wood-grained inner box with hinges. The watch and documentation fit inside, along with an insert showing the exploded diagram of how the watch is constructed and two micro screwdrivers for changing out the strap/bracelet. It’s a decent representation for this watch and price point. 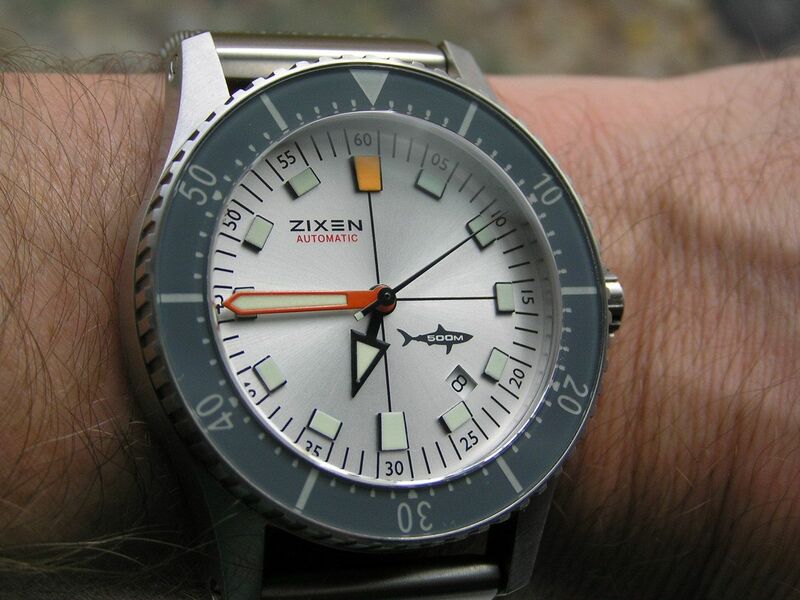 Overall, the Zixen Vintage Diver Nitrox II is an outstanding effort from this micro-brand. 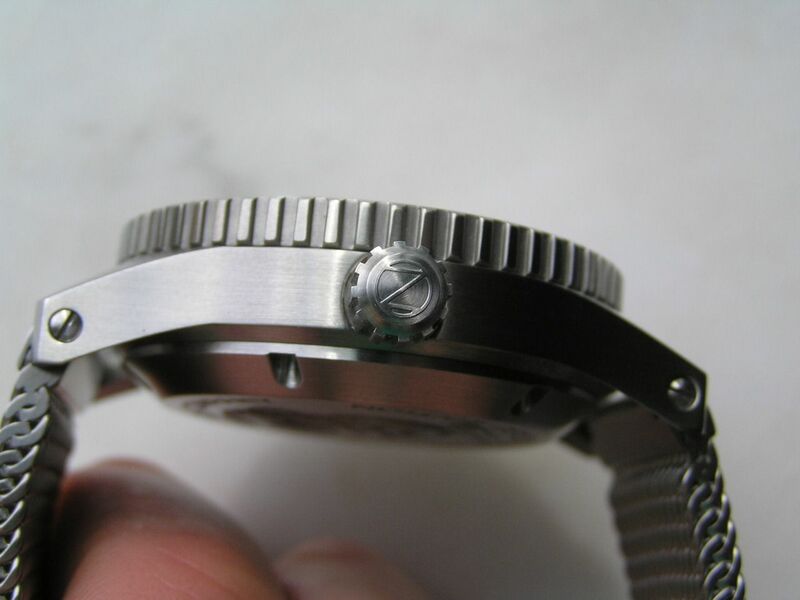 The quality is there and if they take the amount of time that was taken to adjust the automatic movement inside my watch on every piece they make, all the power to them. 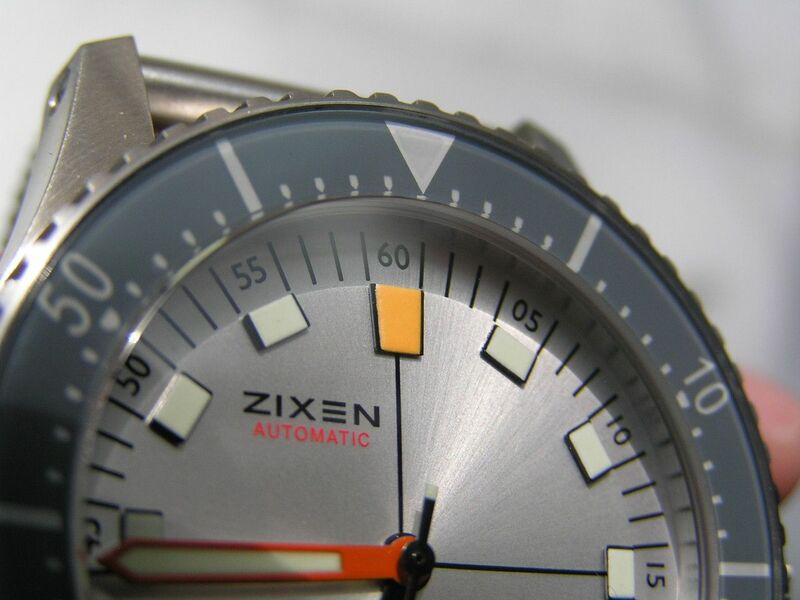 It’s small but important details like this that help make a brand stand out from the crowd, and coupled with the great looks this watch offers, Zixen has produced a winner with the Vintage Nitrox. Congrats! very cool. I appreciate all of your reviews. I'll keep coming back to see whats new.